We’re changing the way nonprofits and the community connect by bringing all the resources together, from directory listings to events to volunteer opportunities. Because if there is a go-to place for everything charity related, it makes it easier for everyone to get involved. And we’re stronger together. A list of the 300+ nonprofits, organizations, and programs offered in Southern Utah with contact information and descriptions. Search by name, keyword, or category to find the organization you need. Your guide to local charity and community events, as well as classes and support groups. Our calendar features several categories, including Arts & Culture, Charity, Community, and Classes/Support Groups, allowing you to easily filter and discover events you’re interested in. Event listings include all the details, from location to tickets to contact info. Bookmark events in our app, making it easy to remember and find the details so you don’t miss out. Ways to give of your extra time, talents and things – a list of volunteer and donation opportunities to help support the organizations that do so much for our community. Use our app to filter by type (volunteer or donation), time (specific date, single project, or ongoing), and participant type (individual or group) to find the perfect fit. Bookmark opportunities you are interested in with our app so you can easily find them later. 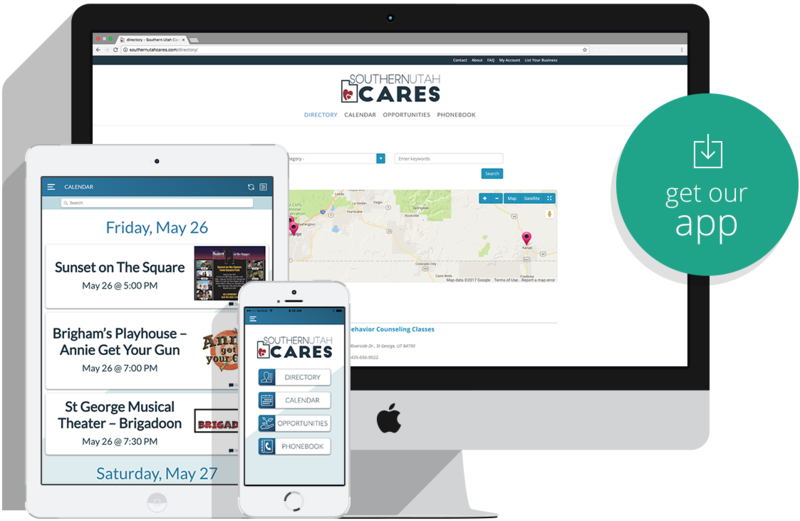 Southern Utah Cares is possible due to the support of the businesses listed in our phonebook. Let’s show them some love! Support socially-minded businesses that are giving back to the community.